For the documentary, see El camino de Santiago (film). The Camino de Santiago (Latin: Peregrinatio Compostellana, "Pilgrimage of Compostela"; Galician: O Camiño de Santiago), known in English as the Way of Saint James among other names, is a network of pilgrims' ways or pilgrimages leading to the shrine of the apostle Saint James the Great in the cathedral of Santiago de Compostela in Galicia in northwestern Spain, where tradition has it that the remains of the saint are buried. Many follow its routes as a form of spiritual path or retreat for their spiritual growth. It is also popular with hiking and cycling enthusiasts and organized tour groups. The French Way (Camino Francés) and the Routes of Northern Spain are the courses listed in the World Heritage List by UNESCO. The Way of St. James was one of the most important Christian pilgrimages during the Middle Ages, together with those to Rome and Jerusalem, and a pilgrimage route on which a plenary indulgence could be earned; other major pilgrimage routes include the Via Francigena to Rome and the pilgrimage to Jerusalem. The Way can take one of dozens of pilgrimage routes to Santiago de Compostela. Traditionally, as with most pilgrimages, the Way of Saint James began at one's home and ended at the pilgrimage site. However, a few of the routes are considered main ones. During the Middle Ages, the route was highly travelled. However, the Black Death, the Protestant Reformation, and political unrest in 16th century Europe led to its decline. By the 1980s, only a few hundred pilgrims per year registered in the pilgrim's office in Santiago. In October 1987, the route was declared the first European Cultural Route by the Council of Europe; it was also named one of UNESCO's World Heritage Sites. Since the 1980s the route has attracted a growing number of modern-day international pilgrims. Whenever St. James's Day (25 July) falls on a Sunday, the cathedral declares a Holy or Jubilee Year. Depending on leap years, Holy Years occur in 5-, 6-, and 11-year intervals. The most recent were 1982, 1993, 1999, 2004, and 2010. The next will be 2021, 2027, and 2032. The pilgrimage to Santiago has never ceased from the time of the discovery of St. James's remains in 812 AD, though there have been years of fewer pilgrims, particularly during European wars. The main pilgrimage route to Santiago follows an earlier Roman trade route, which continues to the Atlantic coast of Galicia, ending at Cape Finisterre. Although it is known today that Cape Finisterre, Spain's westernmost point, is not the westernmost point of Europe (Cabo da Roca in Portugal is farther west), the fact that the Romans called it Finisterrae (literally the end of the world or Land's End in Latin) indicates that they viewed it as such. At night, the Milky Way overhead seems to point the way, so the route acquired the nickname "Voie lactée" – the Milky Way in French. The scallop shell, often found on the shores in Galicia, has long been the symbol of the Camino de Santiago. Over the centuries the scallop shell has taken on a variety of meanings, metaphorical, practical, and mythical, even if its relevance may have actually derived from the desire of pilgrims to take home a souvenir. Two versions of the most common myth about the origin of the symbol concern the death of Saint James, who was martyred by beheading in Jerusalem in 44 AD. According to Spanish legends, he had spent time preaching the gospel in Spain, but returned to Judaea upon seeing a vision of the Virgin Mary on the bank of the Ebro River. Version 1: After James's death, his disciples shipped his body to the Iberian Peninsula to be buried in what is now Santiago. Off the coast of Spain, a heavy storm hit the ship, and the body was lost to the ocean. After some time, however, it washed ashore undamaged, covered in scallops. 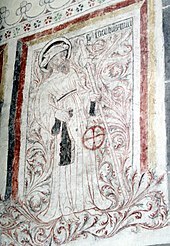 St. James the Moor Slayer (Carrión de los Condes). 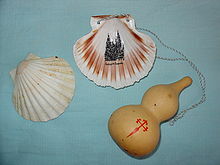 From its connection to the Camino, the scallop shell came to represent pilgrimage, both to a specific shrine as well as heaven, recalling Hebrews 11:13, identifying that Christians "are pilgrims and strangers on the earth". As the symbol of the Camino de Santiago, the shell is seen very frequently along the trails. The shell is seen on posts and signs along the Camino in order to guide pilgrims along the way. The shell is even more commonly seen on the pilgrims themselves. Wearing a shell denotes that one is a traveler on the Camino de Santiago. Most pilgrims receive a shell at the beginning of their journey and either attach it to them by sewing it onto their clothes or wearing it around their neck or by simply keeping it in their backpack. The scallop shell also served practical purposes for pilgrims on the Camino de Santiago. The shell was the right size for gathering water to drink or for eating out of as a makeshift bowl. During the medieval period, the shell was proof of completion rather than a symbol worn during the pilgrimage. The pilgrim's staff is a walking stick used by pilgrims to the shrine of Santiago de Compostela in Spain. Generally, the stick has a hook on it so that something may be hung from it, and may have a crosspiece on it. The pilgrim route is a very good thing, but it is narrow. For the road which leads us to life is narrow; on the other hand, the road which leads to death is broad and spacious. The pilgrim route is for those who are good: it is the lack of vices, the thwarting of the body, the increase of virtues, pardon for sins, sorrow for the penitent, the road of the righteous, love of the saints, faith in the resurrection and the reward of the blessed, a separation from hell, the protection of the heavens. It takes us away from luscious foods, it makes gluttonous fatness vanish, it restrains voluptuousness, constrains the appetites of the flesh which attack the fortress of the soul, cleanses the spirit, leads us to contemplation, humbles the haughty, raises up the lowly, loves poverty. It hates the reproach of those fuelled by greed. It loves, on the other hand, the person who gives to the poor. It rewards those who live simply and do good works; And, on the other hand, it does not pluck those who are stingy and wicked from the claws of sin. The earliest records of visits paid to the shrine dedicated to St. James at Santiago de Compostela date from the 9th century, in the time of the Kingdom of Asturias and Galicia. The pilgrimage to the shrine became the most renowned medieval pilgrimage, and it became customary for those who returned from Compostela to carry back with them a Galician scallop shell as proof of their completion of the journey. This practice gradually led to the scallop shell becoming the badge of a pilgrim. The earliest recorded pilgrims from beyond the Pyrenees visited the shrine in the middle of the 11th century, but it seems that it was not until a century later that large numbers of pilgrims from abroad were regularly journeying there. The earliest records of pilgrims that arrived from England belong to the period between 1092 and 1105. However, by the early 12th century the pilgrimage had become a highly organized affair. The daily needs of pilgrims on their way to and from Compostela were met by a series of hospitals and contributed to the development of the idea itself, some Spanish towns still bearing the name, as Hospital de Órbigo. The hospitals were often staffed by Catholic orders and under royal protection. Donations were encouraged but many poorer pilgrims had few clothes and poor health often barely getting to the next hospital. Romanesque architecture, a new genre of ecclesiastical architecture, was designed with massive archways to cope with huge crowds of the devout. There was also the sale of the now-familiar paraphernalia of tourism, such as badges and souvenirs. Since the Christian symbol for James the Greater was the scallop shell, many pilgrims wore one as a sign to anyone on the road that they were a pilgrim. Pilgrims often prayed to Saint Roch whose numerous depictions with the Cross of St James can still be seen along the Way even today. The pilgrimage route to Santiago de Compostela was possible because of the protection and freedom provided by the Kingdom of France, where the majority of pilgrims originated. Enterprising French (including Gascons and other peoples not under the French crown) settled in towns along the pilgrimage routes, where their names appear in the archives. The pilgrims were tended by people like Domingo de la Calzada, who was later recognized as a saint. Pilgrims walked the Way of St. James, often for months and occasionally years at a time, to arrive at the great church in the main square of Compostela and pay homage to St. James. Many arrived with very little due to illness or robbery or both. Traditionally pilgrims lay their hands on the pillar just inside the doorway of the cathedral, and so many now have done this it has visibly worn away the stone. The popular Spanish name for the astronomical Milky Way is El Camino de Santiago. According to a common medieval legend, the Milky Way was formed from the dust raised by travelling pilgrims. Another legend tells that when a hermit saw a bright star shining over a hillside near San Fiz de Solvio, he informed the bishop of Iria Flavia, who found a grave at the site with three bodies inside, one of which he asserted was Saint James. Subsequently the location was called "the field of the star" (Campus Stellae, corrupted to "Compostela"). Another origin myth mentioned in Book IV of the Book of Saint James relates how the saint appeared in a dream to Charlemagne, urging him to liberate his tomb from the Moors and showing him the direction to follow by the route of the Milky Way. In the registers of the Inquisition at Carcassone...we find the four following places noted as being the centres of the greater pilgrimages to be imposed as penances for the graver crimes: the tomb of the Apostles at Rome, the shrine of St. James at Compostella [sic], St. Thomas' body at Canterbury, and the relics of the Three Kings at Cologne. There is still a tradition in Flanders of pardoning and releasing one prisoner every year under the condition that, accompanied by a guard, the prisoner walks to Santiago wearing a heavy backpack. I have always regretted that We could not find time to make a Pilgrimage to Saintiago de Compostella. We were informed, ... that the Original of this Shrine and Temple of St. Iago was this. A certain Shepherd saw a bright Light there in the night. Afterwards it was revealed to an Archbishop that St. James was buried there. This laid the Foundation of a Church, and they have built an Altar on the Spot where the Shepherd saw the Light. In the time of the Moors, the People made a Vow, that if the Moors should be driven from this Country, they would give a certain portion of the Income of their Lands to Saint James. The Moors were defeated and expelled and it was reported and believed, that Saint James was in the Battle and fought with a drawn Sword at the head of the Spanish Troops, on Horseback. The People, believing that they owed the Victory to the Saint, very cheerfully fulfilled their Vows by paying the Tribute. ...Upon the Supposition that this is the place of the Sepulchre of Saint James, there are great numbers of Pilgrims, who visit it, every Year, from France, Spain, Italy and other parts of Europe, many of them on foot. Adams' great-grandson, the historian Henry Adams, visited Leon among other Spanish cities during his trip through Europe as a youth, although he did not follow the entire pilgrimage route. Another Enlightenment-era traveler on the pilgrimage route was the naturalist Alexander von Humboldt. Although it is commonly believed that the pilgrimage to Santiago has continued without interruption since the Middle Ages, few modern pilgrimages antedate the 1957 publication of Irish Hispanist and traveler Walter Starkie's The Road to Santiago. The revival of the pilgrimage was supported by the Spanish government of Francisco Franco, much inclined to promote Spain's Catholic history. "It has been only recently (1990s) that the pilgrimage to Santiago regained the popularity it had in the Middle Ages." Since then, hundreds of thousands (over 300,000 in 2017) of Christian pilgrims and many others set out each year from their homes, or from popular starting points across Europe, to make their way to Santiago de Compostela. Most travel by foot, some by bicycle, and a few[quantify] travel as some of their medieval counterparts did, on horseback or by donkey (for example, the British author and humorist Tim Moore). In addition to those undertaking a religious pilgrimage, many are hikers who walk the route for travel or sport. Also, many consider the experience a spiritual retreat from modern life. A marking in a boardwalk of the Portuguese coastal way: Coastal sands dunes of Póvoa de Varzim. Here only a few routes are named. For a complete list of all the routes (traditional and less so), see: Camino de Santiago (route descriptions). The Camino Francés, or French Way, is the most popular. The Via Regia is the last portion of the (Camino Francés). Historically, because of the Codex Calixtinus, most pilgrims came from France: typically from Arles, Le Puy, Paris, and Vézelay; some from Saint Gilles. Cluny, site of the celebrated medieval abbey, was another important rallying point for pilgrims and, in 2002, it was integrated into the official European pilgrimage route linking Vézelay and Le Puy. Most Spanish consider the French border in the Pyrenees the natural starting point. By far the most common starting point on the Camino Francés is Saint-Jean-Pied-de-Port, on the French side of the Pyrenees, with Roncesvalles on the Spanish side also being popular. The distance from Roncesvalles to Santiago de Compostela through León is about 800 km (500 mi). The Camino Primitivo, or Original Way, is the oldest route to Santiago de Compostela, first taken in the 9th century and which begins in Oviedo. The Camino Portugués, or the Portuguese Way, is the second-most-popular route, starting at the cathedral in Lisbon (for a total of about 610 km) or at the cathedral in Porto in the north of Portugal (for a total of about 227 km), and crossing into Galicia at Valença. The Camino del Norte, or the Northern Way, is also less traveled and starts in the Basque city of Irun on the border with France, or sometimes in San Sebastián. It is a less popular route because of its changes in elevation, whereas the Camino Frances is mostly flat. The route follows the coast along the Bay of Biscay until it nears Santiago. Though it does not pass through as many historic points of interest as the Camino Frances, it has cooler summer weather. The route is believed to have been first used by pilgrims to avoid traveling through the territories occupied by the Muslims in the Middle Ages. A marker in the pavement indicates the route of the Way of St. James through Navarrete, La Rioja, Spain. In Spain, France and Portugal, pilgrim's hostels with beds in dormitories provide overnight accommodation for pilgrims who hold a credencial (see below). In Spain this type of accommodation is called a refugio or albergue, both of which are similar to youth hostels or hostelries in the French system of gîtes d'étape. Hostels may be run by the local parish, the local council, private owners or pilgrims' associations. Occasionally, these refugios are located in monasteries, such as the one run by monks in Samos, Spain, and the one in Santiago de Compostela. The final hostel on the route is the famous Hostal de los Reyes Catolicos, which lies across the plaza from the Cathedral of Santiago de Campostela. It was originally constructed by Ferdinand and Isabel, the Catholic Monarchs. Today it is a luxury 5-star Parador hotel, which still provides free services to a limited number of pilgrims daily. St. James pilgrim passport stamps in France on the Via Turonensis (Tours route) for the Chemin de St. Jacques de Compostelle. The World Heritage Sites of the Routes of Santiago de Compostela in France lists the major French towns with stamps. Most pilgrims purchase and carry a document called the credencial, which gives access to overnight accommodation along the route. Also known as the "pilgrim's passport", the credencial is stamped with the official St. James stamp of each town or refugio at which the pilgrim has stayed. It provides pilgrims with a record of where they ate or slept and serves as proof to the Pilgrim's Office in Santiago that the journey was accomplished according to an official route and thus that the pilgrim qualifies to receive a compostela (certificate of completion of the pilgrimage). The compostela is a certificate of accomplishment given to pilgrims on completing the Way. To earn the compostela one needs to walk a minimum of 100 km or cycle at least 200 km. In practice, for walkers, the closest convenient point to start is Sarria, as it has good bus and rail connections to other places in Spain. Pilgrims arriving in Santiago de Compostela who have walked at least the last 100 km (62 mi), or cycled 200 km (120 mi) to get there (as indicated on their credencial), and who state that their motivation was at least partially religious, are eligible for the compostela from the Pilgrim's Office in Santiago. Hoc sacratissimum Templum pietatis causa devote visitasse. In quorum fidem praesentes litteras, sigillo ejusdem Sanctae Ecclesiae munitas, ei confero. has visited this most sacred temple for the sake of pious devotion. As a faithful witness of these things I confer upon him [or her] the present document, authenticated by the seal of the same Holy Church. Given at Compostela on the [day] of the month of [month] in the year of the Lord [year]. La S.A.M.I. Catedral de Santiago de Compostela le expresa su bienvenida cordial a la Tumba Apostólica de Santiago el Mayor; y desea que el Santo Apóstol le conceda, con abundancia, las gracias de la Peregrinación. The Holy Apostolic Metropolitan Cathedral of Santiago de Compostela expresses its warm welcome to the Tomb of the Apostle St. James the Greater; and wishes that the holy Apostle may grant you, in abundance, the graces of the Pilgrimage. The Pilgrim's Office gives more than 100,000 compostelas each year to pilgrims from more than 100 different countries. However, the requirements to earn a compostela ensure that not everyone who walks on the Camino receives one. The requirements for receiving a compostela are: 1) make the Pilgrimage for religious/spiritual reasons or at least have an attitude of search, 2) do the last 100 km on foot or horseback or the last 200 km by bicycle. 3) collect a certain number of stamps on a credencial. A Pilgrim's Mass is held in the Cathedral of Santiago de Compostela each day at 12:00 and 19:30. Pilgrims who received the compostela the day before have their countries of origin and the starting point of their pilgrimage announced at the Mass. The Botafumeiro, one of the largest censers in the world, is operated during certain Solemnities and on every Friday, except Good Friday, at 19:30. Priests administer the Sacrament of Penance, or confession, in many languages. In the Holy Year of 2010 the Pilgrim's Mass was exceptionally held four times a day, at 10:00, 12:00, 18:00, and 19:30, catering for the greater number of pilgrims arriving in the Holy Year. The Xunta de Galicia (Galicia's regional government) promotes the Way as a tourist activity, particularly in Holy Compostelan Years (when 25 July falls on a Sunday). Following the Xunta's investment and advertising campaign for the Holy Year of 1993, the number of pilgrims completing the route has been steadily rising. The next Holy Year will occur in 2021, 11 years after the last Holy Year of 2010. More than 272,000 pilgrims made the trip during the course of 2010. Source: The archives of Santiago de Compostela. The pilgrimage is central to the plot of the film The Milky Way (1969), directed by surrealist Luis Buñuel. It is intended to critique the Catholic church, as the modern pilgrims encounter various manifestations of Catholic dogma and heresy. The Naked Pilgrim (2003) documents the journey of art critic and journalist Brian Sewell to Santiago de Compostela for the UK's Channel Five. Travelling by car along the French route, he visited many towns and cities on the way including Paris, Chartres, Roncesvalles, Burgos, Leon and Frómista. Sewell, a lapsed Catholic, was moved by the stories of other pilgrims and by the sights he saw. The series climaxed with Sewell's emotional response to the Mass at Compostela. The Way of St. James was the central feature of the film Saint Jacques... La Mecque (2005) directed by Coline Serreau. In The Way (2010), written and directed by Emilio Estevez, Martin Sheen learns that his son (Estevez) has died early along the route and takes up the pilgrimage in order to complete it on the son's behalf. The film was presented at the Toronto International Film Festival in September 2010 and premiered in Santiago in November 2010. On his PBS travel Europe television series, Rick Steves covers Northern Spain and the Camino de Santiago in series 6. In 2013, Simon Reeve presented the "Pilgrimage" series on BBC2, in which he followed various pilgrimage routes across Europe, including the Camino de Santiago in episode 2. Anne Carson, "Kinds of Water" (1987). A prose poem that traces the narrator's journey, focusing on the philosophical questions it raises, especially with regards to the nature and desire of the pilgrim. The piece can be found in the anthology of Carson's essays, Plainwater (1995). Ernest Hemingway, The Sun Also Rises (1926). Jake's journey from France to the fiesta of San Fermin is an undertaking of the pilgrimage of Santiago de Compostela. Hape Kerkeling, I'm Off Then: Losing and Finding Myself on the Camino de Santiago (2009), on his 2001 voyage. It is the best-selling German-language non-fiction book since Gods, Graves and Scholars (1949). James Michener, Iberia (1968), contains one chapter about the Camino de Santiago. 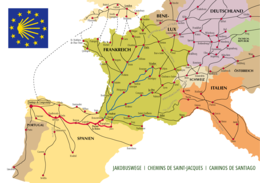 ^ In other languages: Spanish: El Camino de Santiago; Portuguese: O Caminho de Santiago; French: Le chemin de Saint-Jacques; German: Der Jakobsweg; Italian: Il Cammino di san Giacomo. ^ Including "Saint James' Way", the "Road to Santiago", and the UNESCO designation, the "Routes of Santiago de Compostela". ^ "Routes of Santiago de Compostela: Camino Francés and Routes of Northern Spain". UNESCO. ^ a b c Starkie, Walter (1965) . The Roads to Santiago: Pilgrims of St. James. University of California Press. Kent, William H. (1913). "Indulgences" . In Herbermann, Charles (ed.). Catholic Encyclopedia. New York: Robert Appleton Company. This entry on indulgences suggests that the evolution of the doctrine came to include pilgrimage to shrines as a trend that developed from the 8th century A.D.: "Among other forms of commutation were pilgrimages to well-known shrines such as that at St. Albans in England or at Compostela in Spain. But the most important place of pilgrimage was Rome. According to Bede (674–735) the visitatio liminum, or visit to the tomb of the Apostles, was even then regarded as a good work of great efficacy (Hist. Eccl., IV, 23). At first the pilgrims came simply to venerate the relics of the Apostles and martyrs; but in course of time their chief purpose was to gain the indulgences granted by the pope and attached especially to the Stations." ^ "Holy Years at Santiago de Compostela". Archived from the original on 16 September 2014. Retrieved 6 March 2014. ^ "Medieval footpath under the stars of the Milky Way Archived 17 December 2006 at the Wayback Machine". Telegraph Online. ^ "Camino de Santiago en Navarra". Government of Navarre. Retrieved 21 October 2013. ^ "Pilgrim's Way to Santiago: Curiosities". Navarre Tourist Board. ^ Waldron, Thomas (1979). "The Sign of the Scallop Shell". The Furrow. 30 (10): 646–649. JSTOR 27660823. ^ "Brief history: The Camino – past, present & future". Archived from the original on 1 March 2012. Retrieved 6 March 2014. ^ Davies, Bethan; Cole, Ben (2003). Walking the Camino de Santiago. Pili Pala Press. p. 179. ISBN 0-9731698-0-X. ^ Bignami, Giovanni F. (26 March 2004). "Visions of the Milky Way". Science. 303 (5666): 1979. doi:10.1126/science.1096275. JSTOR 3836327. ^ Aruna Vasadevan (5 November 2013). "Santiago de Compostela (La Coruña, Spain)". In Trudy Ring; Noelle Watson; Paul Schellinger (eds.). Southern Europe: International Dictionary of Historic Places. Taylor & Francis. pp. 621–624. ISBN 978-1-134-25965-6. ^ "Pilgrimages". New Advent Catholic Encyclopedia, retrieved 1 December 2006. ^ "Huellas españolas en Flandes". Turismo de Bélgica. Archived from the original on 1 April 2012. ^ "John Adams autobiography, part 3, Peace, 1779–1780, sheet 10 of 18". Harvard University Press, 1961. August 2007. ^ Mitchell-Lanham, Jean (2015). The Lore of the Camino de Santiago: A Literary Pilgrimage. Two Harbors Press. p. xv. ISBN 978-1-63413-333-3. ^ Erimatica. "Estadística de peregrinos del Camino de Santiago a 2018". Camino de Santiago. Guía definitiva: etapas, albergues, rutas (in Spanish). Retrieved 25 July 2018. ^ "The present-day pilgrimage". The Confraternity of Saint James. Archived from the original on 15 July 2006. ^ a b "Informe estadístico Año 2016" (PDF). Oficina del Peregrino de Santiago de Compostela. Retrieved 18 September 2017. ^ "Primitive Way-Camino de Santiago Primitivo". Retrieved 15 December 2015. ^ The Confraternity of Saint James. "The Camino Portugués". Retrieved 17 May 2016. ^ "The Compostela". Confraternity of Saint James. Archived from the original on 29 January 2015. Retrieved 6 August 2016. ^ "The Compostela". Oficina del Peregrino de Santiago de Compostela. ^ "Masses Hours". catedraldesantiago.es. Catedral de Santiago de Compostela. Archived from the original on 12 August 2016. Retrieved 6 August 2016. ^ "The Botafumiero". catedraldesantiago.es. Catedral de Santiago de Compostela. Archived from the original on 12 August 2016. Retrieved 6 August 2016. ^ "The Holy Year: When Does the Holy Year Take Place?". catedraldesantiago.es. Catedral de Santiago de Compostela. Archived from the original on 16 August 2016. Retrieved 6 August 2016. It is Holy Year in Compostela when the 25th of July, Commemoration of the Martyrdom of Saint James, falls on a Sunday. 8 December 2015 – 20 November 2016, Pope Francis's Extraordinary Jubilee of Mercy, was also a Holy Year. ^ "Pilgrims by year according to the office of pilgrims at the Cathedral of Santiago de Compostela". Archived from the original on 1 January 2010. ^ "Pilgrims 2006–2009 according to the office of pilgrims at the Cathedral of Santiago de Compostela". Archived from the original on 19 January 2012. ^ "Statistics". Archived from the original on 14 August 2014. ^ "Statistics". Oficina del Peregrino de Santiago de Compostela. ^ "The Way (2010)". IMDb. Retrieved 8 June 2012. ^ "The way official movie site". Theway-themovie.com. Retrieved 10 July 2011. ^ "Rick Steves travel show, episode: "Northern Spain and the Camino de Santiago"". ricksteves.com. Archived from the original on 27 April 2011. Retrieved 8 June 2012. Camino de Santiago Map Google Map of the Camino de Santiago main route. Available to download offline.